Cortina d’Ampezzo is a beautiful ski region in Italy, with a great Olympic history, an upscale historic ski village, and stunning Dolomite scenery. Cortina’s skiing covers three separate ski resorts of the vast Dolomiti Superski collection– Cinque Torri, Tofano, and Faloria. Cortina is not connected by lifts to the rest of the Dolomite ski region (a total of 1,200 kilometers of ski trails, 450 lifts and 12 ski areas), which makes Cortina unique and perhaps more exclusive, it’s also truly spectacular and stylish. Monte Faloria and Monte Cristallo offer skiing on the northern side of Cortina, often with the most snow. From downtown you take the Faloria Cable Car up two stages to the skiing above 2,000-meters. The views are sensational and the eight ski runs here, red and black, are well pitched and fun. Skiing over to Monte Cristallo, there’s one incredible run from the double chair, the Forcella Staunies, where you are surrounded by the red rock cliffs on both sides, its more challenging but the run is gorgeously groomed. Looking up at Monte Cristallo at 3,221-meters is amazing. Tofane, or Tofana, is to the south of Cortina with more great terrain, trails with real “emotion” as the Italians say. Tofana offers Cortina’s longest slopes surrounded by dramatic red rocks, reached by a two stage cable car to Col Druscie to Ra Valle. The third summit tram to namesake Tofana peak (10,643’) is too steep to ski and runs only in summer – tremendously popular with all the same mountain huts and chalets open for hikers and sightseers. You must ski the women’s downhill – Olympia – with its steep undulating pitches that squeeze between rock bands and big fences. Cortina hosts the World Cup ski races mid-January every year, and the town fills with race fans, media and the chic wanting to be seen. Alberto Tomba shows up, he grew up skiing at Cortina. Cinque Torri is the 3rd Cortina ski area, a short drive from Tofane, named for the five towering peaks. These sunny south exposure slopes offer a dozen gorgeous trails and some wide open powder shots in between the stunning rock towers – but be warned of rocks, aka dolomites. What’s fascinating about this region is the remaining World War caves and tunnels tucked in the steep rock cliffs. As you freely ski by bunkers and hideouts, it’s amazing to think of soldiers who fought in these severe Dolomites to protect democracy. Fascinating that Germans, Italians, Austrians, Russians, and Americans now ski side by side and enjoy peaceful ski runs below the harsh cliffs. Cortina became a world-class ski resort after hosting the 1956 Winter Olympics – but the beautiful town in the Ampezzo Valley (two hours from Venice ) was already famous for its chic clientele, movie stars like Frank Sinatra vacationed here, Pink Panther, James Bond and later Sylvester Stallone’s Cliffhanger were filmed with these towering Dolomites as backdrop. While the Dolomites are not as high as the French and Swiss Alps, they certainly are as scenic in their own special way – steep jagged rock cliffs in red and silver hues depending upon the light. 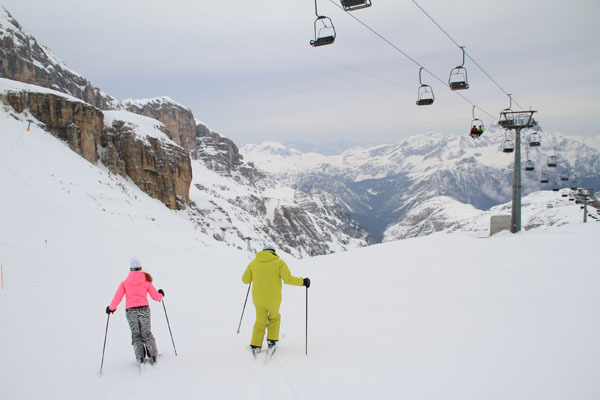 Cortina skiing is the most fashionable of the Alps. The Italians start skiing at the leisure hour of 10 or 11am, dressed in the finest ski attire, stop for a lavish on mountain lunch at 1pm, then ski down to town for apres ski, so if you start skiing early (first cable car) you will have lifts and trails to yourself in the morning, same in the late afternoon. Fun fact: 200,000- years ago these jagged towering Dolomites were reefs under the sea, now the tower 6,000-10,000 feet above sea level. Cortina’s ski slopes are not connected to the rest of the Dolomiti Super Ski Region (though your lift ticket includes the entire 12 areas and 1200 kilometers), and not as popular as the 42-kilometer Sella Ronda tour of the Dolomite ski region, so you don’t have so many skiers just passing through on the ski lifts. We recommend staying in Cortina as part of any Italian family ski trip, staying at the 5-star family friendly Cristallo Hotel and Spa.